Pioneers in the industry, we offer solid bar sawing machine, flying shear tube cutting machine, manual cut off machine, high speed solid bar sawing machine, hmc-600nfa-nc mu4 non ferrous cutting machine and numeric control non ferrous cutting machine from India. The new SOCO Solid Bar Cutting Line incorporates the newest technology with unparalleled functions.This revolutionary innovation brings you the shortest crop length available in the global market 25mm + a (SOCO Global Patent). With capacity up to 110mm in tube sawing and 105mm in solid bar sawing, it is guaranteed to bring you continuous savings and production. 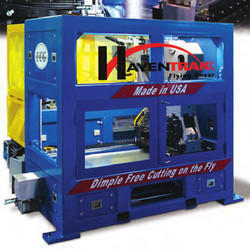 The HavenTrakTM utilizes the speed and precision of our “Dual-Blade Shear” Cut-Off Head combined with Universal Controls Group’s “UTRAK” Length Control System to deliver accurate, high quality, dimple free cuts on the fly. This innovative approach provides improved production rates with increased accuracy at up to 220 FPM. Tube Stop Manually Adjustable Target Stop Or Optional Precision Target With Digital Readout. Not all tube recutting operations require a fully automated process. The manual tube cutoff is built with the same cutoff head components and tooling used in our automatic tube recut machines. Utilizing the dual-blade shearing process, it has the versatility to cut rounds, squares, rectangles and var- ious shapes. 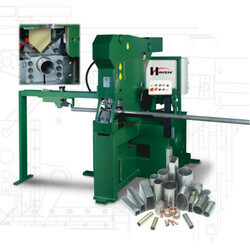 The operator pushes the mill length tube through the cutting dies and into the target mechanism to signal clamping and cutting of the tube. Cut tubes are dis-charged when the operator feeds a new cut length. Cutting dies and blades are easily removed for rapid changeover to new sizes. Ideal for reworking random mill length tubes, or manufacturing cell applications. Hydraulic System PUMP: 100 Gal. hydraulic oil reservoir, frame mounted. PUMP: 100 Gal. hydraulic oil reservoir, frame mounted. The new SOCO Solid Bar Cutting Line incorporates the newest technology with unparalleled functions.This revolutionary innovation brings you the shortest crop length available in the global market: 25mm + a (SOCO Global Patent). 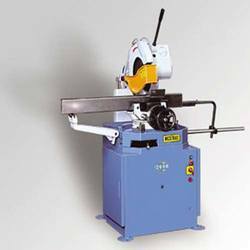 With capacity up to 110mm in tube sawing and 105mm in solid bar sawing, it is guaranteed to bring you continuous savings and production. High precision Cutting: Rigid structure to reduce vibration. 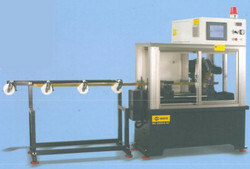 Servo Controlled Material Feeding: To ensure the cutting length tolerance to be within +1-0.1 mm. 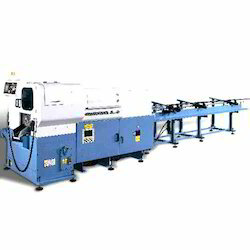 Smooth Cutting Surface: After cut-off and before the saw blade returns, the finished work-piece moves forward and the raw material moves backward. Therefore, no knife scratch is left on the work-piece to ensure smooth cutting surface. Touch Screen for easy operation and learning. High Power Output: High speed cutting and designed for mass production. 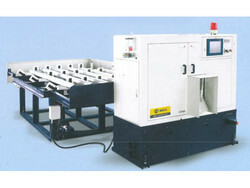 With MU4 Loading Magazine, a fully Automatical Production Line, saving man power & increase the production rate. With discharge convey unit WDC05, the working piece after cutting will be sent out automatically, The first crop & end crop will be also sent out and separated automatically. Totally enclosed design, ensuring safety and environment protection. Burr Free & Less Dust: Self Centering vise with two sides clamping to solidly hold the work piece and ensure a smooth and burr free cutting surface. Low operation noise and low pollution working environment. Cooling System: Equipped with electrical cooling pump and a large coolant tank to ensure excellent working temperature on the Saw Blade and the Work Piece, as well as a smooth cutting surface and longer blade life. 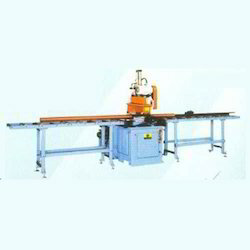 We are an expert manufacturer of High Speed Solid Bar Sawing Machines that are praised by our clients for high efficacy and long life span. Our manufacturing department always prefers the finest quality inputs to develop these highly productive bar sawing machines. 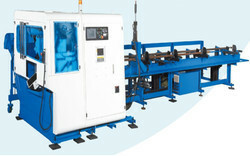 We are offering Semi Automatic Circular Cold Sawing Machine to our customers. Patented Floating Feeding Carriage for superior cutting length accuracy and smooth material handling. 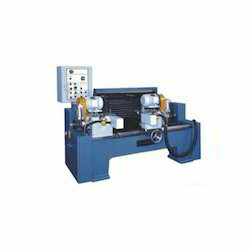 Looking for Tube Cutting Machine ?